For years, I’ve been intrigued by meditation. I’ve heard about the benefits, including relief from anxiety to better sleep, but never really knew how to start. Well, where better to try it out in Thailand? 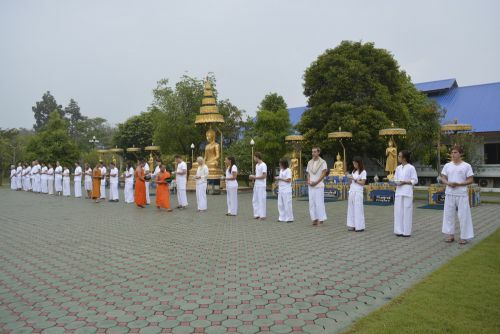 There are many different meditation experiences here, but I went with one organized by the local Buddhist university. Every Tuesday, they hold a 2-day meditation workshop for anyone interested in learning. You arrive at the office at 1 pm and sign in, then a monk gives you some information about how the retreat will work, plus an introduction to meditation and Buddhism. One of the most interesting things for me was learning that Buddhism isn’t really a religion, in the sense of worshipping a God of any sort. The Buddha was a human, who just happened to be the first “enlightened” one and he is honored for being a great teacher, not for any status as a higher being. Probably the most important philosophy for me was the concept “you” are not the same as “your brain“. My paraphrasing of the logic is that you don’t know what your brain will think in the future and it often thinks thoughts you don’t want or can’t control, so it must be operating at least partially independently from “you”. You have a relationship with your body where it serves you, but also has issues you can’t control, and the same is true of our brains. We need to tend to our brains just as we tend to our body to make it function better. With that in mind, you can view your mind as a cluttered house (because you haven’t been tending to it) and meditation is just the process of gradually sweeping out rooms and letting some air in. How much better do you feel when your house is clean and decluttered? Exactly! 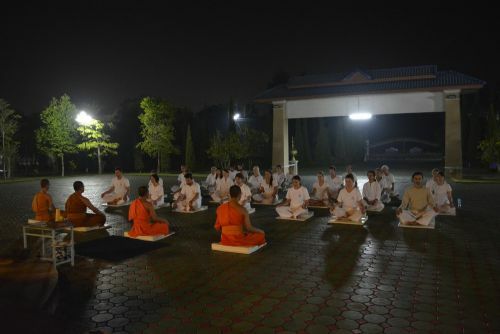 Around 3 pm, about 20 of us took songtaews about 45 minutes out of the city to their meditation center. It consists of a long dormitory building, a meditation building, and some other service buildings. At the front of the grounds, near the meditation center, lies a courtyard with a big gold Buddha. 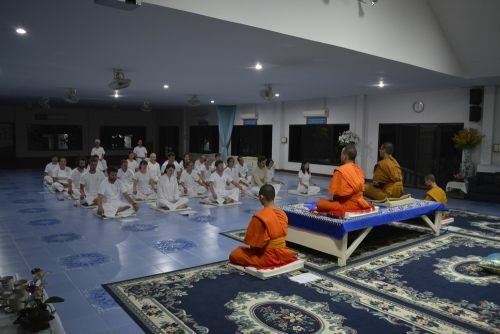 From then on, we learned about different types of meditation (sitting, standing, walking, lying) and had a monk lead us through sessions ranging from 30 to 90 minutes. The retreat is silent, except for discussions with the monk and quiet talk with your roommate (you share a room with 1 other person). Around 6 pm on day 1, we had a simple dinner of pad thai. Eating in a room of 20 people without hearing talking is really weird, but you kind of get used to it after a while. 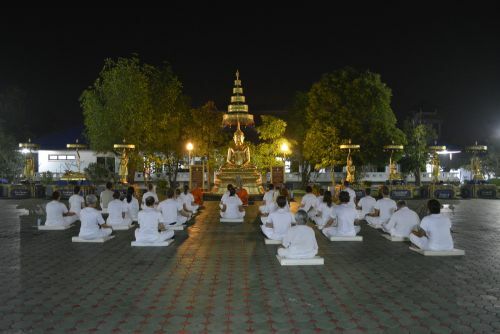 We then had an evening session of meditation out in the courtyard by the Buddha statue, which was really neat. Day 2 begins at 5 am as they ring a gong outside your door until your light goes on. At 5:30, we headed out to the Buddha courtyard for morning meditation and yoga while daylight breaks. While 5 am is obscenely early, this was an amazing way to begin the day. We then went to the cafeteria and got a bowl of rice to offer to our monks as alms. (Monks everywhere in Thailand go out early in the morning and citizens offer them food. They only eat what is offered and get by on 2 meals a day). We then headed in for a breakfast of vegetable soup and toast. Next was a 90 minute discussion with the monks where they asked us questions about our experience with meditation and we were able to ask them any sort of question. (Most were about being a monk, meditation, Thailand, or Buddhism.) As with Kirsten, I found this fascinating and learned so much about Thai and Buddhist culture. I wish I’d done this our first month here. The discussion was followed by another meditation session, a lunch of yellow curry with potatoes, then one more meditation session before heading back to town about 3 pm. I was really glad I went to this! Learning to focus your attention is hard at first, but improvement comes with each session and I definitely found an easing of stress. The first two nights I was back home, I meditated at bedtime and fell asleep fairly quickly, without all the normal thrashing around my mind does while keeping me up at night. The monks recommend a 15-30 minute session in the morning and before bed, and a couple minutes in the middle of the day if you can swing it, but there’s no requirement. But in general, the more you do it, the more skill you’ll achieve and benefits you’ll receive. Cost was 500 Baht ($17) for the 2-day retreat plus 300 Baht ($10) I paid to buy a set of white clothes. Note: They also have a drop-in session for talking with monks on Mondays, Wednesdays, and Fridays from 5-7. This happens at the university campus and gives them a chance to demystify Buddhism and it gives the students a chance to practice English. I highly recommend it. They monks love to talk about their life and will answer almost anything. The ones who speak pretty good English tend to have a nice sense of humor!